Whiplash associated disorders, or whiplash pain, are injuries and pain caused by the excessive extension and flexing of the neck. Disorders include damage to the bones of the neck (the cervical vertebrae). There may also be damage to the main ligaments of the neck, which result in an additional lack of stability in these bones. 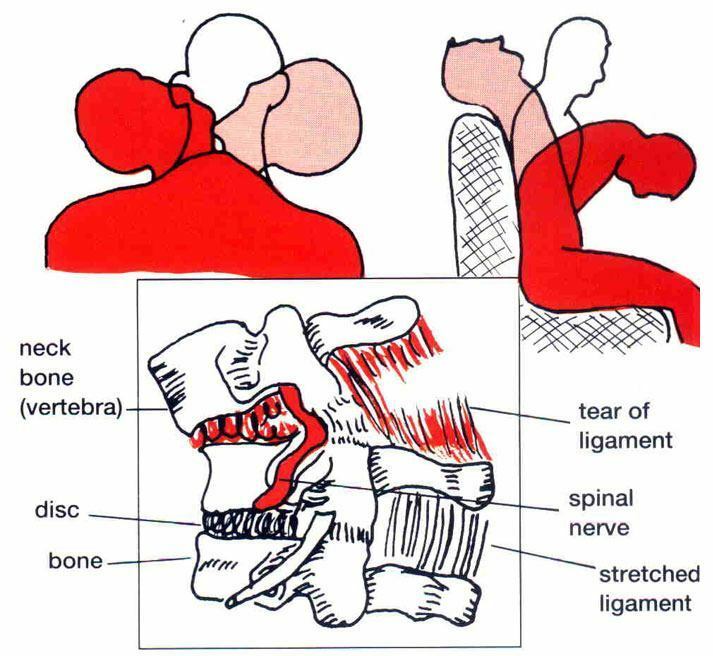 Approximately 50% of whiplash patients also incur damage to the joints between vertebrae, known as the facet joints. This is associated with chronic pain, and in some cases the development of a migraine-like headache. As a patient recovers from whiplash, they may develop a lack of range of motion in the neck due to chronic pain. These disorders are associated with the release of inflammatory molecules, which is also understood to be a source of pain. Whiplash treatment should incorporate therapies that reduce this. Whiplash is a condition commonly associated with motor vehicle accidents. It is caused by violent jolting of the neck in situations where the body is subject to rapid acceleration and/or deceleration. This might occur in a car accident, most often when one car is hit from behind by another. It is also associated with sports and recreational activities such as skiing or riding roller-coasters. Another possible cause is assault, i.e. being punched, kicked, or violently shaken. Whiplash-related injuries are associated with a significant economic and healthcare burden. Treatment for whiplash may start off with physical therapy, chiropractic manipulation, or acupuncture. Chiropractic therapy applied to the neck after whiplash can correct the over-extension and flexing of the neck and help relieve the pain in muscles and ligaments. This may restore at least some range of motion in the neck. Pain-relieving drugs such as non-steroid inflammatory drugs (NSAIDs) may also be taken in the course of whiplash recovery. Another option in more long-term pain relief is epidural nerve injections. Epidural injections, or “blocks” deliver pain-blocking compounds (local anesthetics and/or anti-inflammatory steroids) directly to the spinal nerves that transmit pain signals to the brain. These can be applied to the nerves controlling the facet joints (the medial branch nerves) or to the occipital nerves, and relieve both joint pain and headache if present. These injections achieve effective pain relief, lasting from weeks to months between repeat procedures. The risks of epidural injections are mainly related to side effects of the drugs injected. Steroids can cause arthritis, reduced immune system strength, and weight gain. Anesthetics can cause numbness, nerve damage, and headache after injection. If pain associated with whiplash appears to be intractable, another slightly more invasive option is available. 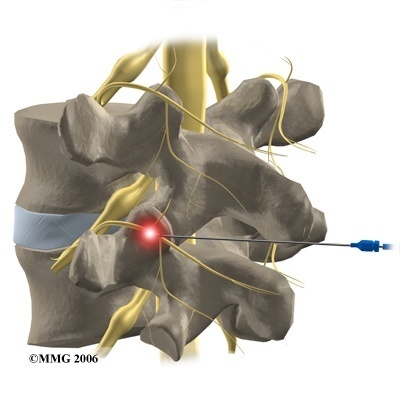 Radiofrequency ablation (RFA) is a technique that uses thin probes and imaging technology such as MRI to locate specifics parts (known as fibers) of spinal nerves that control pain signaling. The probe then delivers an electrothermal pulse to these fibers that destroys them. RFA is effective in whiplash treatment and can be applied to main spinal nerves as well as medial branch nerves in cases where joints are the source of chronic pain. The risks associated with this procedure are infections and bleeding at the probe insertion site. Ablation may also cause inadvertent loss of sensation or movement. 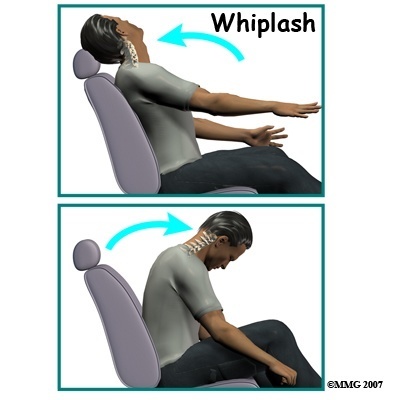 Whiplash is most often associated with abnormal extension and flexing of the neck in the course of a motor vehicle accident. The subsequent injuries and disorders can be a source of chronic pain, even after full recovery from this type of trauma. These injuries can cause damage to the bones of the neck, as well as the muscles and ligaments surrounding them. 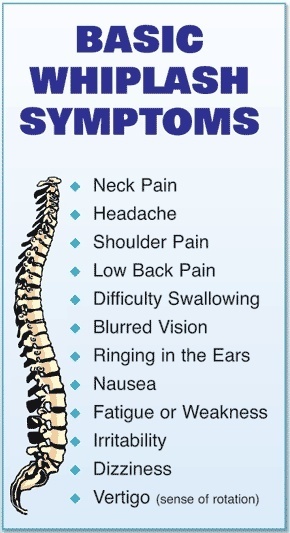 Chronic pain also arises from damage to the joints in the neck that occurs in about 50% of cases. Treatments for whiplash include pharmacotherapy (e.g. NSAIDs) and chiropractic manipulation. Chiropractic intervention can help in reducing the hyper-extension and over-flexing of the neck associated with whiplash. Other treatments involve epidural injection of the spinal nerves controlling painful sensation and of those serving cervical joints. If these options fail to achieve adequate relief, radiofrequency ablation is an effective treatment for persistent pain caused by whiplash. At Nevada Pain our goal is to relieve your whiplash pain and improve function to increase your quality of life. Eichenberger U, Greher M, Kapral S, et al. Sonographic visualization and ultrasound-guided block of the third occipital nerve: prospective for a new method to diagnose C2-C3 zygapophysial joint pain. Anesthesiology. 2006;104(2):303-308. Tominaga Y, Ndu AB, Coe MP, et al. Neck ligament strength is decreased following whiplash trauma. BMC musculoskeletal disorders. 2006;7:103. Becker WJ. Cervicogenic headache: evidence that the neck is a pain generator. Headache. 2010;50(4):699-705. Smith AD, Jull G, Schneider G, Frizzell B, Hooper RA, Sterling M. Cervical Radiofrequency Neurotomy Reduces Central Hyperexcitability and Improves Neck Movement in Individuals with Chronic Whiplash. Pain medicine (Malden, Mass.). Oct18 2013. Smith AD, Jull G, Schneider G, Frizzell B, Hooper RA, Sterling M. A comparison of physical and psychological features of responders and non-responders to cervical facet blocks in chronic whiplash. BMC musculoskeletal disorders. 2013;14(1):313. Teasell RW, McClure JA, Walton D, et al. A research synthesis of therapeutic interventions for whiplash-associated disorder (WAD): part 5 – surgical and injection-based interventions for chronic WAD. Pain research & management : the journal of the Canadian Pain Society = journal de la societe canadienne pour le traitement de la douleur. 2010;15(5):323-334. Liliang PC, Lu K, Hsieh CH, Kao CY, Wang KW, Chen HJ. Pulsed radiofrequency of cervical medial branches for treatment of whiplash-related cervical zygapophysial joint pain. Surgical neurology. 2008;70Suppl1:S1:50-55; discussion S51:55.